20120320 + Up and at the desk all day. 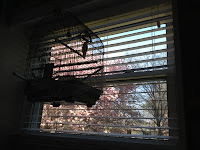 This is the torturous view from my desk chair of the blue sky and magnolia tree on this first day of Spring.... L&G home late, then off to G's Kindergarten Round Up to confirm he is ready for next year. D home, J&I on a walk. On way home we saw D on a ladder trying to reattach he '0' from the '107' on the garage... I finished my work day and then helped D fix the '0' and then L& an excited G back from the Kindergarten Round Up all ready to go! D had to redo some homework and is all out of sorts... Some football throwing, dinner together, the LJ&G to Zumba and D&I met the Pettits at the movie 'Act of Valor'. Home, exhausted.